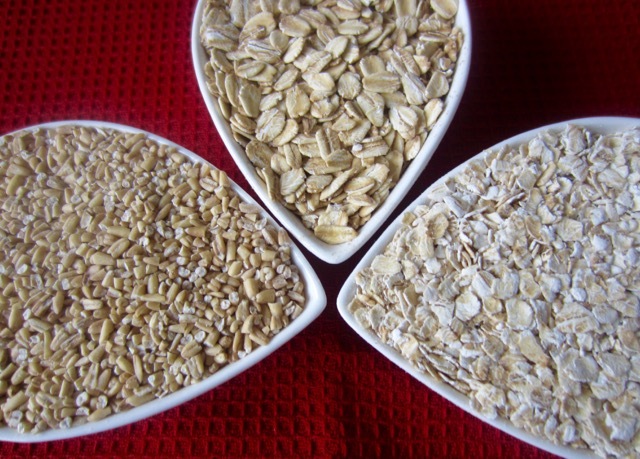 What is the difference between steel cut, rolled and instant oats? All oatmeal are made from whole oat grains (also called groats) with the bran, germ and endosperm intact. The difference is in the processing method and added ingredients. The best way to know what you’re buying is to READ THE LABEL. Steel cut oats, also known as Irish oats, coarse oatmeal or pinhead oats are whole oat grains (groats) that have been chopped into two or three pieces (using steel blades). They are traditionally used to make porridge. Steel cut oats require a fairly long cooking time (about 20-30 minutes) and have a chewy, nutty and hearty consistency. Like lentils or beans, they can be pre-soaked and cooked in about half the time. Steel cut oats have the lowest Glycemic Index (GI), because they take longer to digest so will usually make one feel full for a longer time compared to instant oats that have a high GI. Rolled oats are also known as oat flakes, old fashioned oats or large flake oats.They are the most common form of oatmeal. They are made from whole oat grains (also known as groats), with the endosperm, germ, and bran, intact. The whole grain is steamed then pressed flat with steel rollers. This increases the surface area, so they cook in about 5 minutes. 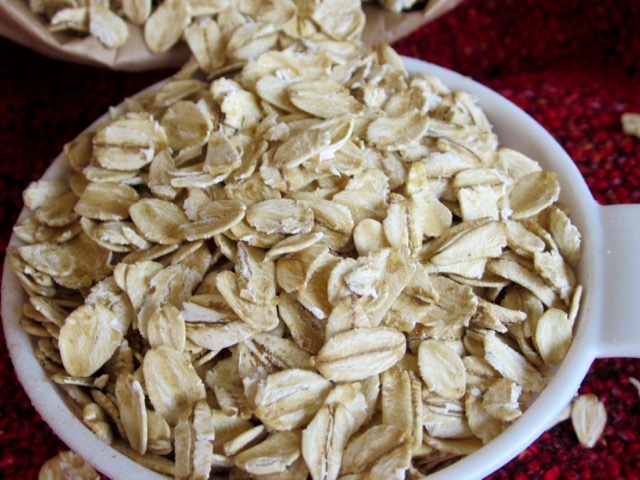 Rolled oats also have a lower Glycemic Index (GI), because they take longer to digest and will usually make one feel full for a longer time compared to instant oats that have a high GI and a lot of added ingredients. 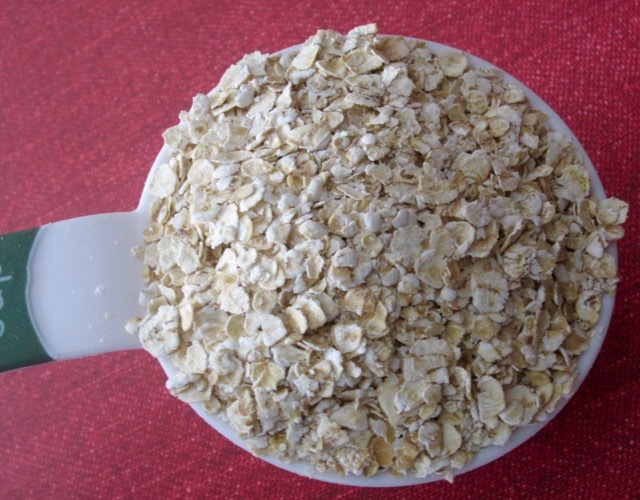 Rolled oats can also be used in baked goods, granola, and granola bars. 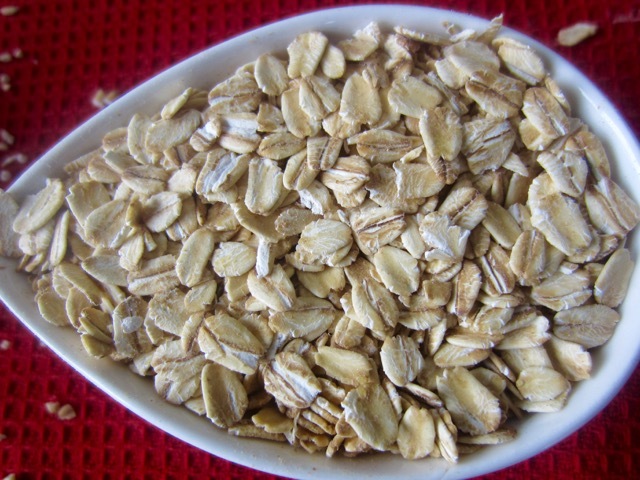 Ingredients in rolled oats, for example, Quaker rolled Oats, are simply 100% rolled oats. They are cholesterol, sugar and sodium free. 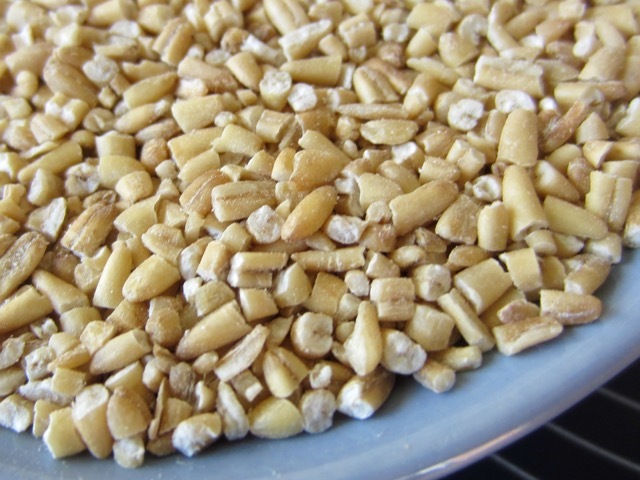 Quick cooking oats are also made from whole oat grains (groats) but the grain is sliced before steaming and pressing with steel rollers. Quick cooking oats cook in about 1-3 minutes, depending on the size of the slices (coarse, regular to fine). The smaller sized ones take less time to cook. Quick cooking oats can also be used in baked goods. 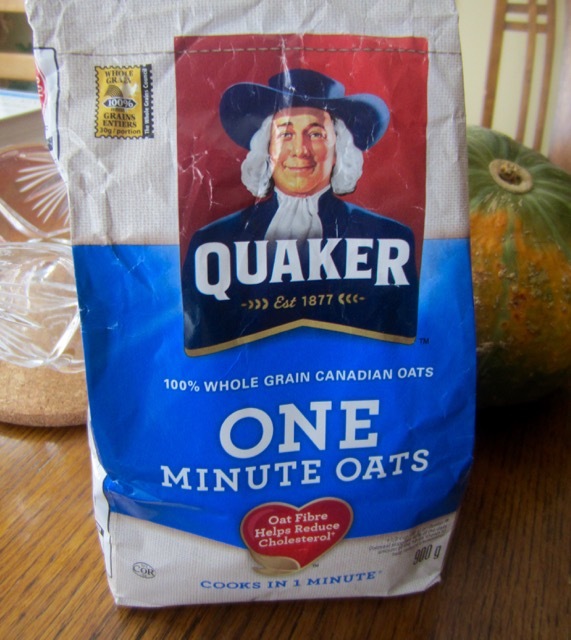 Ingredients in quick cooking oats, for example, Quaker One minute Oats are simply 100% rolled oats. They are cholesterol, sugar and sodium free. Instant oats are also made from whole oat grains (groats) that have been pre-cooked, dried, sliced and then pressed very thin. They have added sugar and other ingredients, depending on the flavour you buy. To prepare instant oatmeal, just add boiling water and you’ll have very smooth hot cereal, with added sugar and other ingredients. Salt, sea salt, sugar, brown sugar, granulated sugar cane juice, maltodextrin, sucralose, natural and artificial flavour, colours,, oat flour, calcium carbonate, soy lecithin, guar gum, roasted soy nuts, flax seeds, ground flax seeds, freeze dried banana, chocolate chips, sweetened dried blueberries, rolled amaranth, apple juice concentrate, sunflower oil, brown rice flour, cinnamon, This list can go on forever. 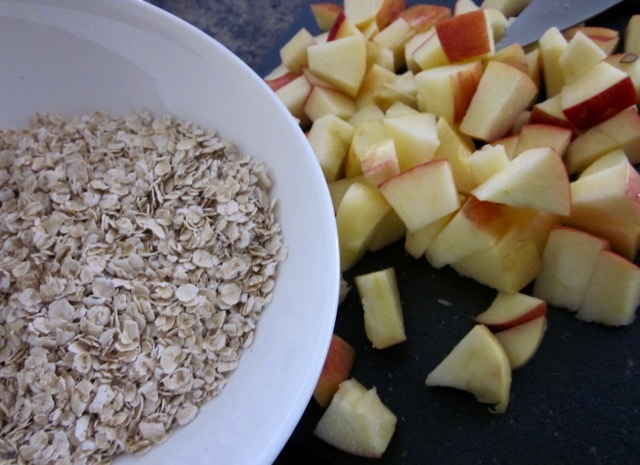 Click here to see the different kinds of boxed oatmeal and their ingredients. In my opinion you should read labels before buying a product. Avoid boxed oatmeal if you want healthy alternatives. Next What is the difference between Water Chilled and Air Chilled Chicken? Wow, thanks Liz for the explanation of the differences. I didn’t realise the carbohydrate differences between the various types. Looks like for my current needs, I need to look for steel cut oats when I stabilise around my new weight. Ha ha so true even though steel cut is not my favourite. I find it too chewy. I eat one minute cooking, because I can make it in the microwave and eat oatmeal on a daily basis. Have a pleasant weekend!